Start with the cake. Preheat the oven to 175 Celsius (350 degrees Fahrenheit) and butter 2 8-inch/20cm round cake tin and line with baking paper. Sift the flour, cocoa, baking soda, baking powder, and salt into the bowl of an electric mixer fitted with a paddle attachment and add the sugar and mix on low speed until combined. In another bowl, whisk together the coconut milk, oil, eggs and cherry brandy. With the mixer on low speed, slowly add the wet ingredients to the dry. With mixer still on low, add the coconut milk, cherries and coconut and mix until just combined. Pour the cake batter into two 20cm prepared cake tins and bake for 35 to 40 minutes or until a cake tester comes out clean. Cool in the pan for 30 minutes, then turn out onto a cake rack and cool completely. For the cherry buttercream add the icing sugar and butter into the bowl of an electric mixer and beat until light and fluffy. Add the food colouring, if using, and beat until well combined. Then add the glace cherries, coconut and cherry brandy. To make the chocolate ganache place the cream and chocolate in a saucepan over a low heat until melted and smooth. Add the cherry brandy (if using) and set aside and let it come to room temperature. To assemble the cake top one cake with the cherry coconut buttercream and then pour the chocolate ganache over the cake, letting it run down the sides. Then use a large offset spatula to spread from the center toward the edges, so that the cake is evenly and completely covered. 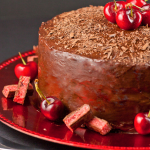 Decorate with fresh cherries or decorate with chopped up cherry ripe bars.